We are facing an overwhelming army of deadly, invisible enemies. We need a plan -- before it's too late. In today's world, it's easier than ever to move people, animals, and materials around the planet, but the same advances that make modern infrastructure so efficient have made epidemics and even pandemics nearly inevitable. And as outbreaks of Ebola, MERS, yellow fever, and Zika have demonstrated, we are woefully underprepared to deal with the fallout. So what can -- and must -- we do in order to protect ourselves from mankind's deadliest enemy? Dr. Osterholm is Regents Professor, McKnight Presidential Endowed Chair in Public Health, the director of the Center for Infectious Disease Research and Policy (CIDRAP), Distinguished Teaching Professor in the Division of Environmental Health Sciences, School of Public Health, a professor in the Technological Leadership Institute, College of Science and Engineering, and an adjunct professor in the Medical School, all at the University of Minnesota. 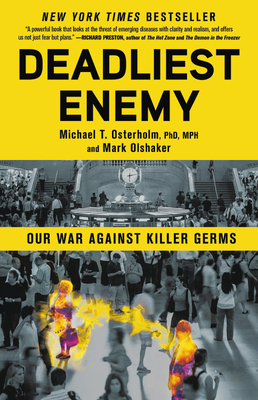 Mark Olshaker is a critically acclaimed, New York Times bestselling author or coauthor of fourteen nonfiction books and novels, including Virus Hunter, and an Emmy-winning filmmaker with specialties in both public health and criminal justice.